As I read the email a second time, I just knew this was a mistake. Sure, Harley’s been a therapy dog for almost a year now. He’s even been to a few schools to participate in their reading programs. But this was going to be a first. Harley was going to High School. Was this a legitimate request? 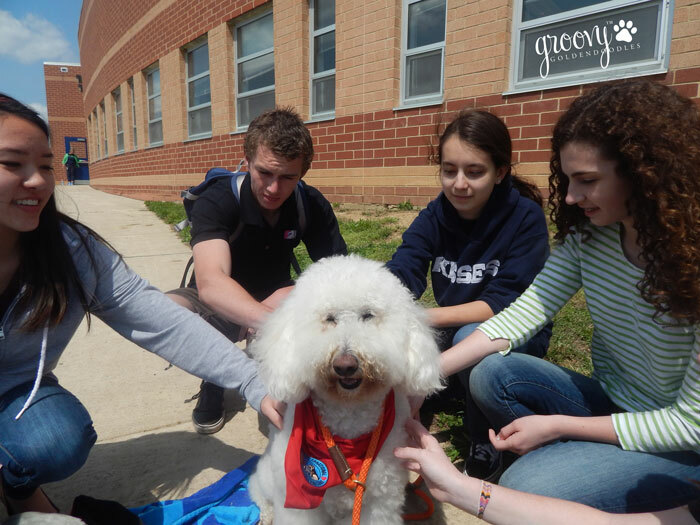 Did they really want a Therapy Dog in the High School? Turns out the answer was more fascinating than I could have imagined. The Standards of Learning (SOL) for Virginia Public Schools is to establish minimum expectations for what students should know and be able to do at the end of each grade or course in various subjects. Tests in (reading, writing, mathematics, science and history/social science) measure the success of students meeting the Board of Education’s expectations for learning and achievement. Apparently – these tests have the potential to create a great deal of stress for students of all ages, so this particular school decided to incorporate a “Stress Less Week” prior to taking their exams. We were asked to arrive by 10:15am. The objective? Hang out by the cafeteria door. 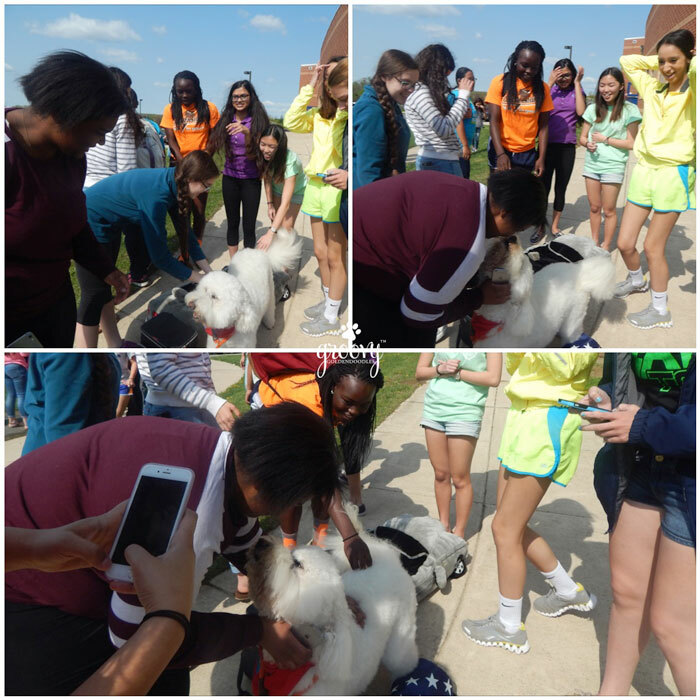 During each lunch period, students would come outside before or after their meal to meet and pet the dogs. I must say, I was a little curious and wondered just how interested teenagers could/would be at the site of a doodle outside their cafeteria door. It will be a while before I forget all those smiling faces and happy voices that I saw coming out of that cafeteria door. They were genuinely happy to see us, excited to greet Harley and extremely polite as they included me in their conversations. Don’t forget to enter the PetPrints 3D Mothers Day Contest! Ohhh this just totally warmed my heart!!! 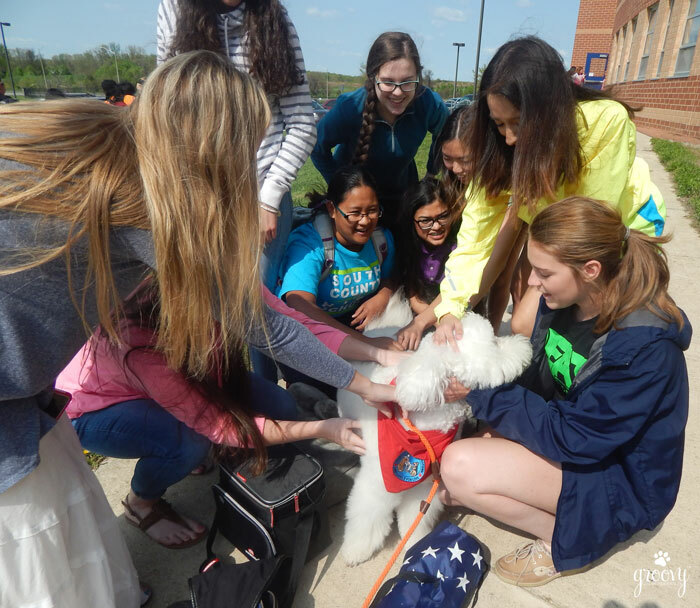 Harley got so much and such well-deserved lovin’ that day and so did the students! It was a great day for both the students and Harley Caren. 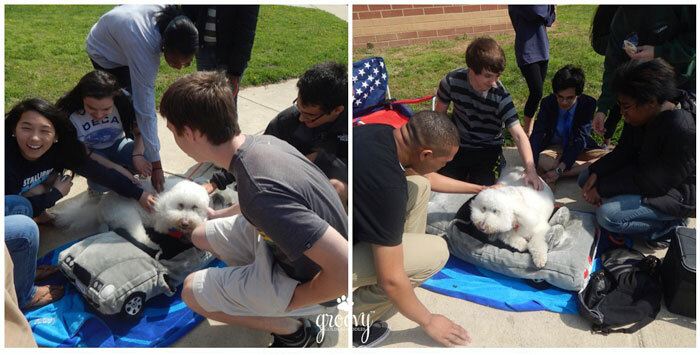 He loved all the attention and the students were pleasantly surprised to see the dogs out there during their lunch period. Harley looks pretty comfortable and stress free as well!! 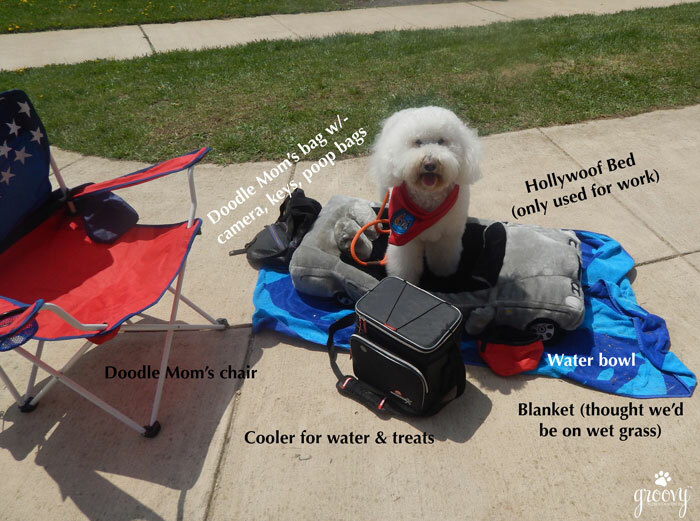 Good job Doodle Mom. 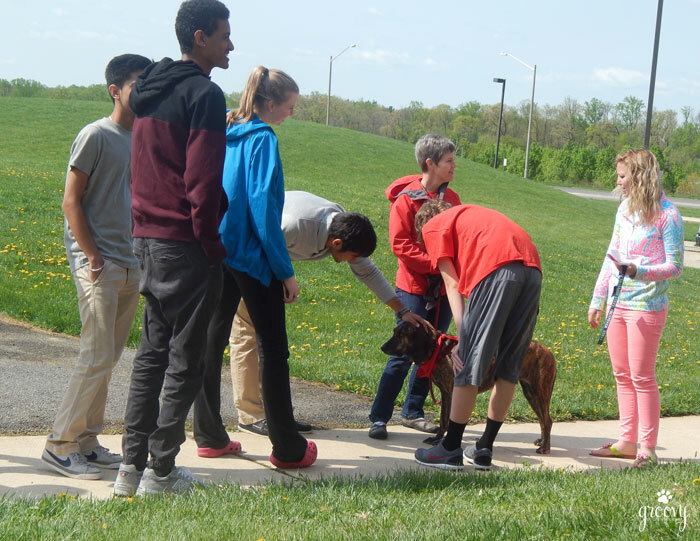 Clever how the school had you stay outside … I was wondering about how the school would handle kids with allergies or are afraid of dogs — staying outside meant it was kids who opted to come see you guys. Lucky kids!! I bet quite a few fell in love with Harley. Hooray!! Being that I am both a graduate and employee of Fairfax County Schools, I think this is great. Keep up the great work C B and Harley. Thanks Ton-Ton – It seemed to go better than expected and there was chatter about bringing him back again. Paws crossed. I’m so happy to hear this, that’s wonderful! Harley looks so comfortable and happy. That looks like such a cool opportunity to meet new human pals!! It was Earl, it was so much fun just being around so much happiness. What an awesome experience for you, Harley, and the students! Happy smiles all around! 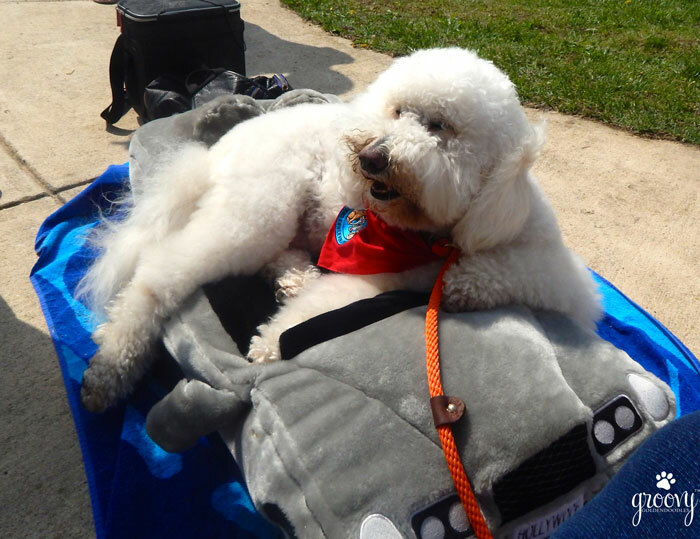 Ohh… he is a TDI dog! I can recognize that bandana from anywhere! Our old dog Kyra (RIP) was a TDI girl too! Harley sure looks like he is having a great time! It’s so awesome to be able to give back to kids like this. He is a TDI dog! You go Christine! I’m loving all the assignments we’ve been given. The HS was so much fun, I hope they call again. We’d love to return. Just make sure you don’t accidentally get sent off to college! HA! That’s a good one Emma, but you know – if a college called we would no doubt go! Have to buy a t-shirt to take a photo in though! How very cool indeed!! I would have loved having a Therapy pup come to my High School ~ I would have taken full advantage of being able to love on and pet such a sweet pup as your Harley. Thanks Barbara – apparently it was a huge hit with the administration. They are already talking about creating another event so we can come back! Yea!!!! What a wondoodleful time that was. You can tell everyone had a great time. Yay Harley! Cole can’t believe Harley liked all those kids all at once!! Harley…GOOD BOY! Harley does remarkably well around crowds LeeAnna. On two occasions he’s given me indicators that he wasn’t comfortable and we left immediately. Both times there were loud noises (firecrackers and such) Never around humans or dogs though. The blanket and bed are only used for therapy work. The bed was donated by Olde Towne Pet Resort when Harley was certified (congratulatory gift) this way he knows when he sees it – what my expectations are. What a positive message that you have taught all of us. Dogs bring so much into our lives each day. Thanks Linda – But all kudos go to the school and of course Harley. He has and continues to teach me so much everyday. He is a very special creature – quirky at times yes, but special none the less. Thanks for stopping by, please come again soon. What a wonderful idea someone had to do that, and look how well it turned out! I’d say that was a WIN WIN for everyone involved! I think it’s so great that you do this with Harley….he sure seems like a natural at it. I love your little work station set up too! Wow, that is really cool. I have a friend who takes her dog to college campuses but didn’t realize high schools are doing this now too. We certainly can have stress at any age, huh?! And dog’s are a big help with that! Good job, you two! Jackie I was as shocked as you! We’re used to going to the elementary schools, so this was truly a new adventure. 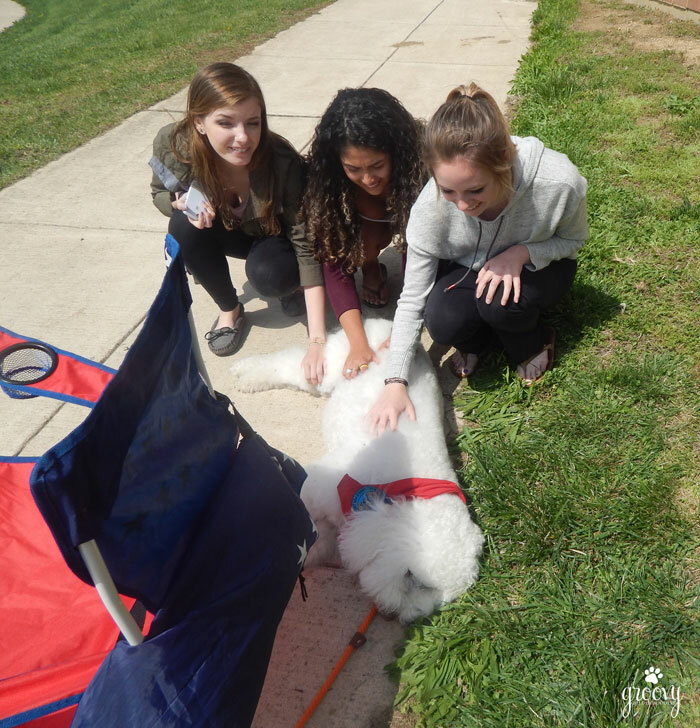 I am pleased to say the students really found it a pleasant surprise and they enjoyed spending 10-15 minutes outside with the dogs. We had a great time too! How awesome! Good job, Harley. Mr. N went to a non-profit fair last week, representing the therapy organization. He hung out on a table and high fived people and did tricks for about an hour and loved it. That last smiley says it all Harley, good work!!! It certainly does Dory – makes my heart smile! This looks like pure torture! Ha! Was this possibly your best day ever? Because it would for sure be mine! Oh – it was painful like you wouldn’t believe LOL Such great memories – they will last a lifetime. Thanks for stopping by our blog, and for your nice comment! 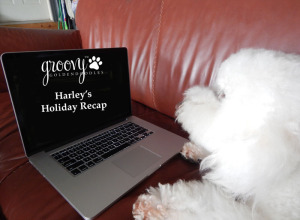 Truth be told, Harley probably had more fun than the students did! It was a wonderful way to spend our day! Take care and have a great rest of the week! What a great service you offer. And how cool is your bed? ?